Come and see us in Frankfurt! The Music Fair in Frankfurt is the largest international trade fair for sheet music, musical instruments, music software and accessories. This year it will be held from 10 to 13 April. During the four days of the fair, all of the leading manufacturers and publishers get together and present new products and trends. In 2013 Henle is completely tuned in to the violin. In Frankfurt we will present the entire blue Urtext violin repertoire. As always at the Henle music booth, all our new releases are waiting to be discovered, along with culinary and musical surprises. 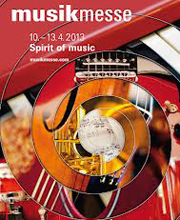 April 10-13, 2013, 9 a.m. to 6 p.m., hall 3.1, booth C 30.